Exfoliating and purifying scalp and hair treatment for all hair types. Gommage Exfoliating Pre-Shampoo is rated 4.5 out of 5 by 17. 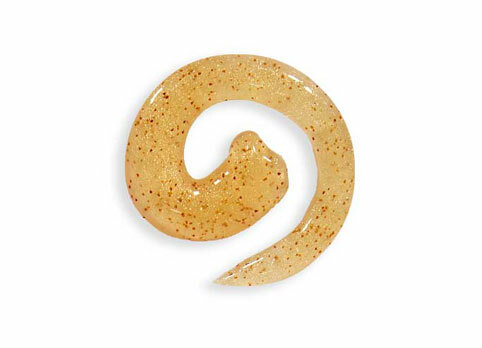 Encapsulated in a gorgeous glittery jelly with ultra-fine grains, apply to slightly wet hair a hazelnut amount of the Gommage prior to shampooing. Distribute evenly onto the scalp section by section. For better exfoliation, massage delicately into the scalp for 5 minutes, add a little water, then distribute throughout from the scalp to the ends of the hair. To finish, emulsify and rinse thoroughly before applying shampoo. Rated 4 out of 5 by Bernice from Awesome! I just purchased this and used it once so far. I used before shampooing my hair and massaged into scalp all over. Rinsed out and then used the kerastase shampoo and another brand conditioner. I dried my hair and noticed how shiney it was and it looked and felt like a child's hair. WOW! I was taken back by the shine. I will be using the exfoliant once a week. Rated 1 out of 5 by Anna87789743 from Bad for your hair Really disappointed with this. I have long hair and found it so difficult to wash out! My hair still has the product in after I've shampooed, used a mask and conditioner. You might as well pour sand in your hair and use that as an exfoliator. Rated 1 out of 5 by Singing Baker from Just was not for me I bought this item a few weeks ago to help with the product build-up on my scalp. This was not the solution for me....The texture was gummy, and was extremely difficult to wash out of my natural, African-American hair even after shampooing and conditioning. I had read a couple of reviews on Amazon that mentioned the same problem, but I had decided to go ahead and purchase it anyways. Not a good choice. It did smell good though. Rated 5 out of 5 by Diane A from The best hair product in the world This is the best stuff ever made. Omg you won't believe what this does to your hair. A total transformation. I tried it once and ordered enough for a years worth to never run out. Your scalp feels clean, fresh, amazing, you can run a comb right through it. Even if you had the worst day you just can't wait to take a shower to use this stuff. You will become an addict and must have. Rated 5 out of 5 by brittany47 from I LOVE this product BUT... It would be so wonderful if it had a pointed tip applicator, that way I could apply this more precisely to my scalp. I use about 1-2x a week, and it really makes my scalp feel nice and fresh, like when you have a freshly exfoliated face. I've been experiencing a lot of hair loss lately, and this seems to be helping new hair grow by keeping my scalp in good shape. I just wish I didn't feel like I was wasting so much of the product, no matter how careful I am, it seems like half of it ends up in my hair and not on my scalp. So overall, fantastic product, but packaging could be improved to make it a bit more user-friendly. Rated 5 out of 5 by Tanya from Important step in care care This is a great addition to Chronologiste line gently clarifying and preparing hair for cleaning. Rated 5 out of 5 by DrGreen from Great product! Cleans, renews, exfoliates and refreshes scalp plus hair. Rated 5 out of 5 by Holly from Amazing Product I have long natural blonde hair. Like a lot of natural blondes my hair has a fine to medium texture but I have a ton of hair. Sometimes hair products do not penetrate the dense hair or they leave a film or weigh it down. I picked this product up with the Chronologiste regimen and it has been a miracle worker for my hair. I find that if I use it, the products do what they are supposed to do better and my hair is left light ans full of body. The product itself feels luxurious. I dampen my hair an take a quarter size and massage it in my scalp for a couple minutes. Then I saturate my hair with water and work it through till rinsed. I am very happy with the Chronologiste line and will continue to purchase this and the other items.